The best time to see pink lady's-slippers, such as this one at the Bowman Street Conservation Area, is the last two weeks of May and the first week of June. Longtime Westborough residents remember when pink lady's-slippers were quite easy to spot in the woods around town, but these days your best chances of seeing this lovely native orchid are at the Bowman Street Conservation Area (the Westborough Reservoir) or the Headwaters Conservation Area (formerly Andrews-Nourse). Memorial Day weekend is often a good choice for a lady's-slipper excursion. The prime time for seeing pink lady's-slippers in Westborough is usually the last two weeks in May and the first week in June. Look for them especially in wooded areas that contain pines. The plants thrive in our acidic eastern Massachusetts soil. They live about 20 years, so you can return year after year to enjoy the same plants in the same location. 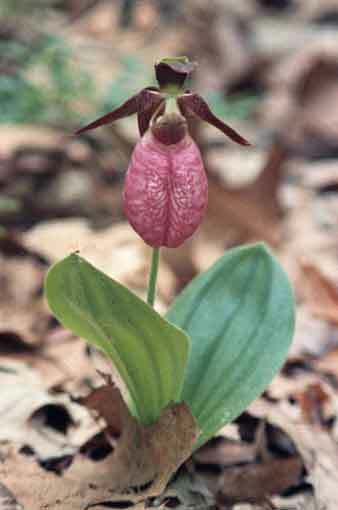 Also known as moccasin-flower, pink lady's-slipper (Cypripedium acaule) gets its name from its large, slipper- or moccasin-shaped pink blossom with brown "shoestrings" above it. Occasionally a variant with a white blossom appears in Westborough's woods. Like many other orchids, pink lady's-slipper needs its growing conditions to be just right. Besides acidic soil, it needs a particular type of soil fungus to help its tiny seeds germinate and grow. In turn, the seedlings supply the fungus with food from photosynthesis. This complex symbiotic relationship between orchid and fungus helps to make the plant difficult to grow from seed or to transplant. This wild plant is uncommon enough that it should never be picked or transplanted. If you want to try to grow pink lady's-slipper in your own garden, buy plants from a nursery that propagates its own (rather than digging them from the wild for resale). One such reputable local source is the New England Wild Flower Society's Garden in the Woods in Framingham (www.newfs.org). Its annual plant sale, to be held this year on Saturday, June 12, offers several types of lady's-slipper, including pink lady's-slipper. Besides preservation, another reason for not picking pink lady's-slippers is that handling the plants can cause a rash similar to poison ivy. The plants are covered with tiny hairs containing a mildly toxic substance. In the 1800s, pink lady's-slipper had a medicinal use that may have contributed to overpicking. Its root was the source of a mild sedative used to treat nervous headaches, hysteria, insomnia, and "female complaints."